Casa Giustina is a stylish apartment located on the ground floor of an antique palace along a central quiet street inside the walls of Lucca. The apartment have been completely renovated in mid 2011 and has all modern comforts, and a beautiful view over a lovely 'secret' garden. The apartment has Wi-Fi Internet connection, satellite TV and air conditioning. 1 double bedroom with king size bed, 1 bathroom with built-in shower (the shower is very large and also have a little window overlooking the garden), 1 large living room with double large size sofa bed to sleep 2 more people, fully equipped kitchen (dishwasher, washer and dryer, freezer, refrigerator, kettle, toaster, coffee maker, 4 ring stoves, etc.). Railway and bus station 5-8 min. Winter heating is charged for 6 euros daily. Legal Notes: Self Catering property: no hotel staff, no maid, no breakfast or meals provided by the owner, no hotel services during the stay. * Approximate monthly price. Actual pricing will depend on the days of the month you stay. Hallo everyone! My name is SONIA and I am from Lucca. I run my Lucca Holiday Rentals company that offers exceptional apartments in the heart of Lucca. My goal is to help you fall in love with Lucca – to discover, explore, taste and savor new sights and experiences in this incredible city. My company began almost 10 years ago when I started to rent my family villa after my parents moved to the mountains when they got retired. I spent there my entire childhood and I grew up there in deep contact with the nature and the history. My father thaught me everything about the birds and the antique trees and flowers of the villa and the smell of the sizzling pans used to wake me up each Sunday morning after my mum started to cook! I was fascinated by her when she was telling me the history of the villa in the past century. I thought this kind of feelings are too precious to let them go so then I had the idea to share my love of Lucca and “la dolce Vita” by finding beautiful apartments , villas and farmhouses in my favorite Lucca neighborhoods among my family members properties. Lucca Holiday Rentals started out as a boutique family company and now there are over 15 people working together. We are a friendly and enthusiastic team who will assist you every step of the way, from your first enquiry to your arrival in Lucca. Your Lucca experience begins with where you stay, and we offer you a warm home on the rolling hills of Lucca or in the heart of the walled town. Each of our property is carefully hand picked to ensure it meets our standards of authenticity and warmth, including outstanding locations in authentic Lucca neighborhoods. Find fully remodeled kitchens and bathrooms, comfortable beds with quality linens, exceptional locations, breathtaking terraces and panoramic views. When you reserve, we open our address book and share our favorite Lucca resources with you to help you plan and enjoy your stay – from excellent tour guides to cooking classes, private chefs, favorite restaurants and cafés to the best pastry shops in the neighborhood. Relax, explore, and enjoy each day to the fullest, experiencing a vacation in Lucca that you’ll remember for a lifetime! My Philosophy My goal is to offer you an extraordinary experience in one of Forbe’s Best Town in the World by enhancing your vacation and helping you to explore and experience the delights of living in Lucca. Me and my helpful and knowledgeable team will guide you through your vacation planning process and help you choose the perfect apartment for your stay. When you’ve booked, the adventure begins. Want to explore the open air markets near your apartment, take a cooking lesson, relax on the Walls at sunset or hire a chef to cook dinner in your apartment? Based on our many years in Lucca, we happily share our resources and favorite suggestions for our guests so you can savor the fun of living like a local during your stay. The bathroom has a grand built-in shower. A baby crib and an high chair are available upon request. A payment parking is located in 5 min walking from the apartment. A free parking is located in less than 10 min walking from the apartment. Located near the center of Lucca, this ground-floor apartment provided easy, walkable access to all restaurants, grocery stores, cafes, and historical sites. Expect some street traffic, but Lucca is a generally quiet town, so noise doesn’t pose a significant problem. The furnishings of the apartment appear as shown in the photos, but have experienced wear. The apartment would benefit from a thorough cleaning, as well, for example, the creamy white sofa showed considerable use and needed cleaning, and the shower contained what appeared to be mold growing on the floor and walls. With a face lift and scrubbing, this apartment could once again attain the charming aspect that many before us experienced. Perfect stay in Lucca May 2018. 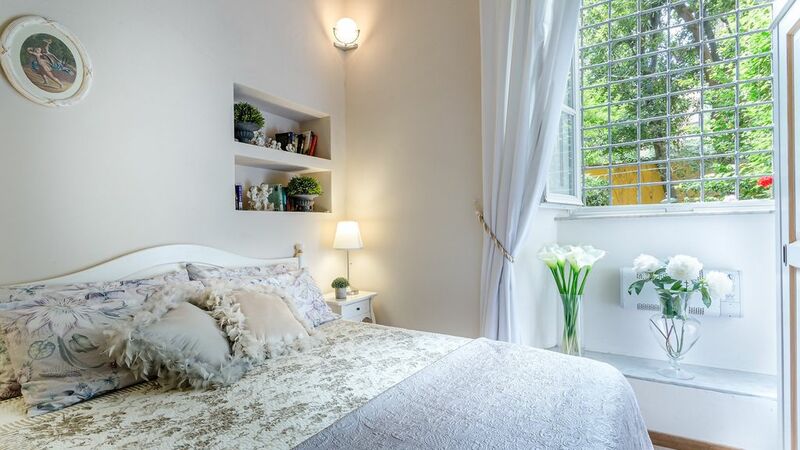 Lovely little apartment right in the heart of Lucca. Everything you could possibly need was thought of, hairdryer, ironing board, kettle !! Very clean & perfectly located. Didn’t need to use air conditioning in May but wouldn’t be able to open the huge windows in height of summer for mosquitoes!! We were lucky only a few about & only a couple of bites! Booklet left explained everything we needed to know & got on ourselves perfectly. Map supplied also a godsend! If we ever make it back to Lucca would definitely stay there again. Wonderful wonderful holiday ! Wonderful decorated apartment and very kind owners of the property. This apartment wonderfully situated within the walks of Lucca and close to everything, public transportation and sightseeing. It has lovely views over a private garden and it had everything we could desire. Sonia was great and attentive to our needs, everything seemed could be made and we just needed to ask but there was nothing more to desire. . A much recommended place to stay. We had a wonderful week at Casa Giustina. The villa is absolutely apartment and in a perfect location for day trips by train to Cinque Terra, Florence, Pisa, Viareggio and Siena. Thank you to Cristina and Sonia for meeting us and getting us settled, they have been perfect hosts and Elisa and Paolo for looking after us throughout the week. The apartment is extremely homey and comfortable, the wifi connection was perfect. Thanks to all for the amazing week! Location is best feature. On a quiet street away from busy and noisy areas but near everything. As I said superb location. Nice and quiet, mostly residential, very secure. Well equipped in terms of cooking and dining. Don't expect microwave but has electric kettle. WiFi signal is very good. Excellent shower and hot water. Air con great in living area but limited reach into bedroom. Rooms are much smaller than photos imply. Beautiful courtyard garden but it belongs to a neighbour so no access, mosquitoes are a problem, don't open bathroom window as the net has a hole. Only 2 bathtowels and 1 handtowel provided and one set of sheets - not enough for an 11 night stay. The mattress and pillows don't have any protectors and the pillows were stained. The sofa also needs a clean or covers could be changed to something more practical. Try Osteria Miranda for a meal.. really special. Ostello Fredrica has a nice garden if you want a beer in the Sun. Polli bike hire people are really helpful and an old Lucca family business. Buy train tickets day before or allow plenty time as office is sometimes shut and ticket machines are busy. Take plenty mozzie protection! Hallo, the apartment has a view over the garden but it does not say that belongs to the apartment: it's just a pleasant view. The apartment is not advertised to have outdoor area. Mosquito screens have been installed. 6 large towels are provided and not as stated in the review. A change of towels and linens is always provided, just need to ask: I suggest travellers to keep in communication with me as I am the host and I am available to help during the stay. Makes no sense to complaint at the END of the stay, just need to ask DURING the stay. We loved this one bedroom apartment. We were on a very quiet street but we were just minutes away from everything. We were glad we stayed within the walls because the city changes when the tour buses leave. We would absolutely stay here again! Minimum stay is 4 nights. Winter heating is charged for 6 euros daily. Legal Notes: Self Catering property: no hotel staff, no maid, no breakfast or meals provided by the owner, no hotel services during the stay.